Trees are so much a part of our daily lives, whether we take them for granted or find ourselves fighting for their survival: so it is perhaps unsurprising that there are many stories from all over the world that feature trees, woods or forests as a central theme or ‘character’… Even so, I don’t think I expected quite such a rich and plentiful collection when I started bringing these picture books together – and I’m sure there are more, so please do add to this list. 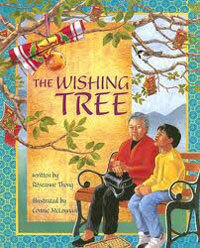 Meanwhile, for non-fiction tree picture books, take a look here; and for poetry, go here. The stunning Gond-style illustrations give this story the strong cultural identity of Madhya Pradesh in central India, but the emotions it evokes are universal. Any child who has found themselves alone in a wood with just their imagination for company will empathise with this story: and whether they have or not, Alone in the Forest provides a delicious frisson of fear from the safety of a book! The book design deserves a special mention too. Nicholas Oldland has written other books with the same cast of Canadian forest creatures but these are the two that I know so far. They are very funny stories with a definite, universal message. In The Busy Beaver, a beaver is so busy ‘he didn’t always think things through’ – which often has unpleasant consequences for the other forest animals. And ‘it was only a matter of time before something went terribly wrong.’ Some forced time out to reflect causes the beaver to make some changes in his life and work to put things right. These are books that make children laugh as well as offering a life lesson to take away with them. What more can you ask? 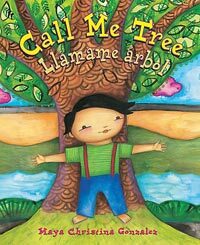 The spare but lyrical narrative of this beautifully-crafted book in both English and Spanish follows a child’s awakening to a sense of self. Taking the tree as a metaphor, it weaves an affirming message to young children, reinforcing a sense of individual value as well as rootedness and belonging – and potential, for just as a tree grows and reaches for the sky, so can the child. Cleverly and significantly, the text is gender-free – do read about Maya’s very deliberate quest for this here. The beautiful illustrations depict children from different ethnic backgrounds and also incorporate children in the yoga tree pose. A great companion to two of Maya’s previous books, My Colors, My World / Mis colores and I Know the River Loves Me / Yo sé que el río me ama, this is an empowering book that truly celebrates diversity. 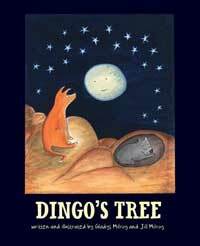 Dingo can’t find a tree of his own so he draws one, a beautiful rain tree he calls Little Tree, but which soon grows so tall even the moon can’t see the top of it. When the animals’ lives are threatened with destruction, Dingo’s tree is at the heart of the solution: indeed, it is the actual heart of the solution. I described this story, inspired by the ravages of mining on the Kimberley landscape in Australia, as ‘apocalyptic, which is an unusually strong message in a children’s picture book. It does end on a note of hope but that’s because the people have all gone.’ And I asked Gladys Milroy about this in an interview in 2012. This is a beautiful, sad and ultimately uplifting picture book for older readers that challenges them to change the ending, as it were, by calling a halt to our harmful exploitation of the environment. This is an energetic retelling of the legend of Bon Bibi, her twin brother Shah Jongoli and Dokkhim Rai, beautifully illustrated and just right for reading aloud. 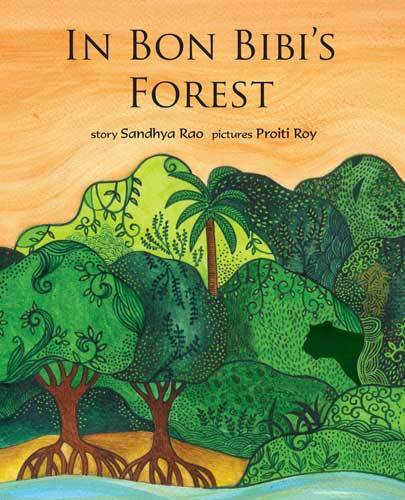 See some of the illustratins and read more about In Bon Bibi’s Forest in my interview with illustrator Proiti Roy. What makes this book special is the dual narrative – set in the UK now, Christopher loves hearing his Grannie’s stories about her native Dominica. She weaves folklore into the tales she tells – and Ti Bolom is very much alive both for the girl (Grannie) in Dominica and Christopher himself, as we discover when he has to go to bed! There’s plenty here to offer a lively, interactive readaloud, and the illustrations bring the forest alive and contribute to the build up of suspense. 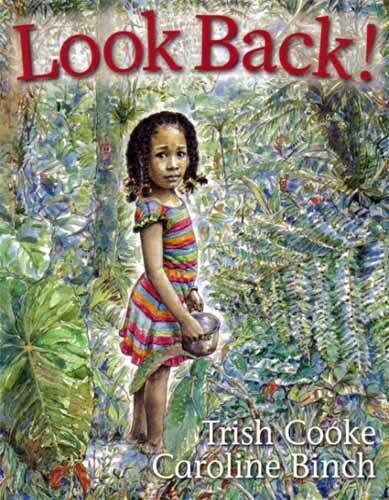 Read more about Look Back! in my interview with author Trish Cooke. It’s amazing what can fit together in a tree when you put them all into a fun counting rhyme! The numbers are sequenced clearly so that the book is perfect for introducing numbers to young children, with the added joy of being utterly absurd. The counting starts off logically enough with ‘one dizzy ant’ – certainly small enough, you would think, to allow plenty of room in the tree: but by the end it is having to vie for space with a delightfully improbable selection of animals up to ten ‘hefty elephants’. 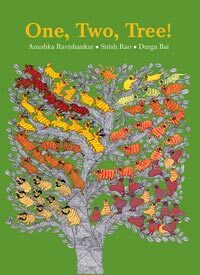 The stunning illustrations in the Gond style from central India highlight each new creature as it arrives in the tree, and offer almost endless entertainment as young readers search for and count all those who are already there. This is an engaging counting book that will appeal to young children way beyond learning the basic numbers 1-10. 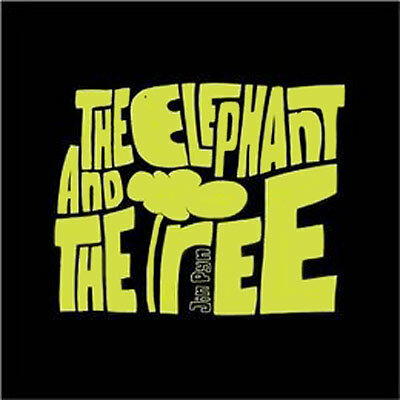 An elephant and a tree are best friends. They grow up together and tell each other about those things that the other can’t see or experience. Then one terrible day ‘the forest shrilled and shook’ – the elephant was captured, and the tree was chopped down and, as it happened, made into a saddle for the elephant. There is no happy ending to this story, but there is hope, for as long as they can remember and share memories of those times when they took their freedom for granted. This is emphasised in the striking artwork: yellow graphics are used against a black background throughout but white chalk is used to depict their captivity and, as I pointed out in my review of this stunning picture book for older readers, chalk can be rubbed out. This is a stirring tale with magic, shivers and romance. The Queen is beautiful and horrible; Jenna is brave and satisfyingly feisty; and Tam Lin is worth saving! The magic swirls from the pages and I love the wicked, wee fairy folk, clearly influenced by the illustrations of Arthur Rackham. (Janetta Otter-Barry Books, Frances Lincoln, 2013 (UK)/ 2014 (US)). The heroine here is called Janet and she is featured on the cover holding on to Tam Linn even though the Queen has turned him into a bear – read my full review here. This was one of the first of Tara Books’ many award-winning titles to gain well-deserved international recognition. 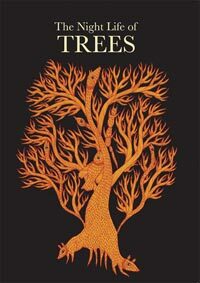 Trees are central to the culture of the Gond people of Madhya Pradesh in central India, not only for the shade, shelter and food they provide, but for the myths and folklore they have inspired. It is at night that the spirits of the trees come to the fore, and here those trees are given visual space with minimal text to convey their stories: trees such as the glowing Sembar, intoxicating Mahua, the ‘tree of song’, the ‘binding tree’… Serpents, birds and forest creatures intertwine with the intricate patterns of the trees – or make up the actual branches themselves. Although the palette of each individual portrait is restricted, no two trees are depicted in the same colours and the overall effect is dazzling, especially given the night-time, black paper on which they are printed. Everything about this book is special – the stunning artwork; the matter-of-fact tone of the text compared with the wonders of what it is conveying; and the book itself, screen-printed and made by hand. When she was a baby, Tamanna’s best friend was a tree called Kuchi and they ‘told each other everything’. 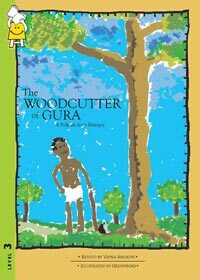 As Tamanna grows older, her friends tease her until she stops talking to Kuchi, at which point she finds she can no longer hear the tree’s whispers anyway… Not until she is grown up with a daughter of her own, when one day she hears Kuchi calling to her in desperation and is just in time to stop the tree being chopped down. This whimsical story will especially appeal to any child who has had an imaginary friend. It goes much deeper than a superficial first reading suggests, with undertones of the interplay between childhood, growing up and adulthood, as well as the inherent connection between children and nature. 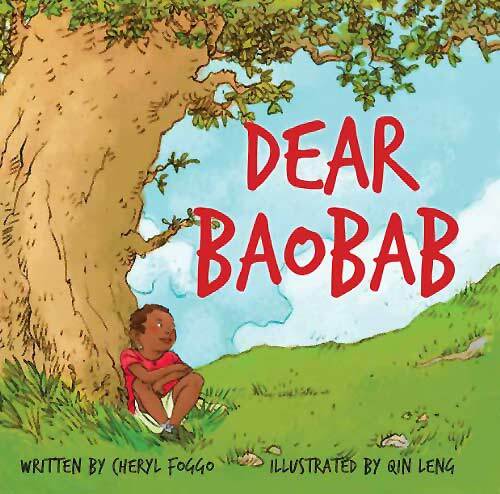 Young readers spend a day with Bulbuli in her bamboo world, from the moment she awakens in her bamboo bed to her return to it and ‘bamboo dreams’ at bedtime. 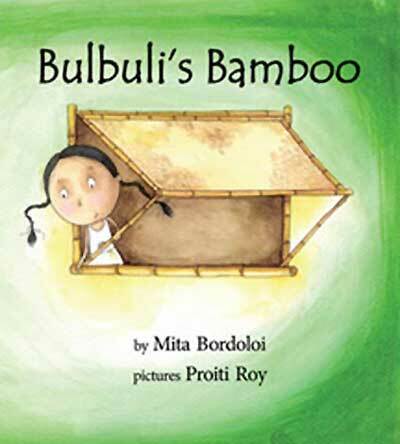 In between she eats bamboo shoot soup, climbs down the bamboo ladder and takes a trip in her bamboo boat. If young readers take heed of the order she does things in for the first half of the day, they will be able to anticipate her routine in reverse in the second half. The illustrations are delightful and altogether this is a charming book, with a few factoids about bamboo thrown in at the end. And on the subject of facts, purists will point out that bamboo is actually a grass: but I have chosen to include it among the trees since bamboo, amazing plant that it is, grows as tall as trees; we can walk through bamboo ‘forests’; and we so often treat it and craft it like wood… And Bilbuli’s Bamboo would make a lovely bedtime story as well as a charming introduction to this incredible versatile ‘tree’. Read my full review; and find out more about the book’s background in my interview with illustrator Proiti Roy. 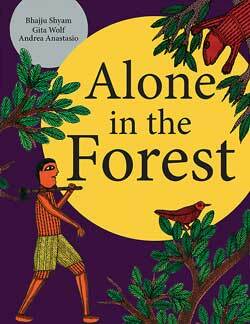 When seven-year-old Maiko moves from Africa to live with his uncle and aunt following the death of his parents, his memories of home are wrapped up in the ancient baobab tree in the centre of his village, and a fir tree in his new garden becomes his confidante as he adjusts to his new life. This touching story raises many questions for young readers, who will also empathise with some of Maiko’s experiences such as being teased at school and the importance of kindness and being thoughtful. Read my full review here. 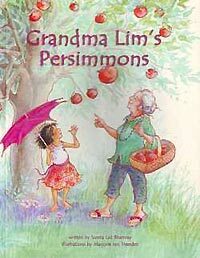 Grandma Lim is saving the biggest persimmon on her tree for her granddaughter Mei Ling but when a freak wind blows it off the tree, it would seem that it is doomed. All is not lost, however, thanks to the ingenuity of three special friends whose assistance will remain a special secret between delighted young readers and themselves… This is a sweet story and the charming illustrations cleverly enhance the build-up to what actually happens, allowing for young readers to be gleefully in-the-know for second and subsequent readings. This would be a lovely book for grandparents to share with their grandchildren. When a boy’s parents bring home his new brother Simón, he immerses himself in his ship model-making and imaginary adventures on the high seas. 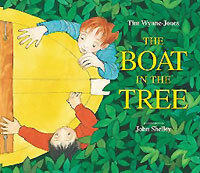 As the boy tells his story, speech bubbles in the illustrations offer a perspective on a the increase in tension between the new brothers, until one day he runs away, all the way to the river, more or less at the end of the garden… Simón comes to find him and makes another discovery – a boat has been lifted into a tree by the storm. They work together to get the boat onto the water but will the boy actually allow Simón to sail it with him? The narrative and illustrations each tell their part of the story and integrate into a beautifully crafted book about adoption very much from an older sibling’s perspective. The beauty and universality of the story is enhanced by Christy Hale’s palette of earthy and pastel colours and her textured and tissue-paper collages, with people both individualised and represented by silhouettes. As author Lauren Thompson points out in Julie Danielson’s insightful interview, ‘the trees in the first spreads of the book are leafless. Toward the end, everything is blooming’ – and you can read a continuation of this interview with spreads from the book here. Solomon is devastated when the old maple tree in his garden is blown down in a storm. To console him, his uncle carves a mask for him, as a way to preserve the spirit of the tree. Solomon tells Uncle about the humming birds that nested in the tree and Uncle relates the traditional hummingbird story, which he then also represents on the mask. As Solomon talks, listens and watches the transformation of the maple wood into something beautiful he will be able to keep for ever, the healing process begins. 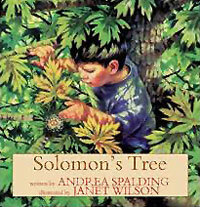 Solomon’s Tree is a story that tugs at the heart strings and helps children to understand the notion of the cycle of life. The artwork is beautiful, capturing the richness of autumn and woodland contrasts of light and shade, and emphasising the Tsimpshian cultural roots of the story. In fact, Andrea Spalding was inspired to write the story after she took part in a workshop with Tsimpshian master carver Victor Reece (1946-2010). He provided Andrea Spalding with traditional designs of the Raven and Grandmother Moon for the incidental illustrations, as well as carving a stunning mask incorporating the humming bird, as shown in the afterword. In this way, author and illustrator were able to follow the whole creation process and reflect it accurately in the book. The most beautiful butterfly in a lovely garden is shunned by the other butterflies because it is proud and boastful. One day it comes across a black, ugly tree and is so incensed that it sets about destroying it. The next day the butterfly is horrified to discover that the tree has grown again and is colourful and beautiful – whereas the butterfly has lost all its colours and turned black. 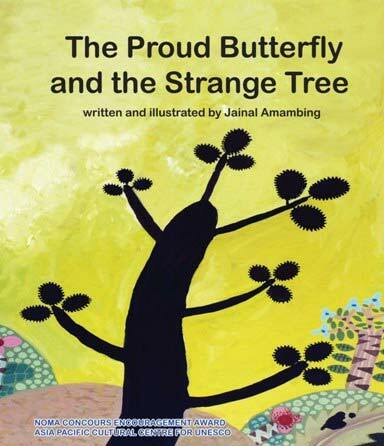 None of the other creatures in the garden want anything to do with it, but eventually the butterfly’s genuine repentance is rewarded and it regains its colours, its friends, but not its pride… This is a simple but effective fable that is brought to life by Jainal Amambing’s vivid portrayal of the butterfly’s emotions, as well as his distinctive strong colours and patterns. See some illustrations from the book and read more about Jainal himself here. This moving story captures the excitement of making wishes, as well as the special relationship between grandparents and grandchildren. It also introduces a note of realism in pointing to the futility of making unrealistic wishes. The illustrations are exquisite and there are instructions at the end for readers to make their own wishing paper. 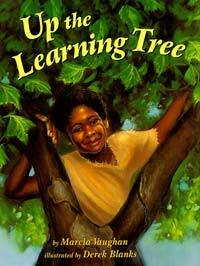 Zora loves to climb the chinaberry tree and look to the far horizon, dreaming of all she could do – but it seems that everything she wants to do, like travelling to the distant places she can see or even fishing, is only open to boys… Even her father tells her she should wear dresses and be a young lady. However, Zora’s mother encourages her daughter to go out and meet people, and makes her promise not to forget the stories she has learnt. 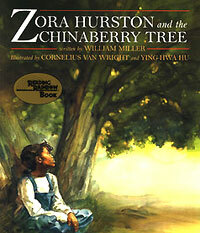 When her mother dies, Zora finds refuge in the chinaberry tree, and reaffirms the promise she has made. The watercolour illustrations bring Zora to life – I especially love the images of her gazing out from the tree and playing checkers with men in the town store. This is a great story for reinforcing the importance of aspiration and dreams, with all the more validity because it is based on the autobiographical writings of renowned African American author and folklorist Zora Neale Hurston (1891-1960). The story gets across very well the blend of affection and irritation that often characterises inter-generational relationships. 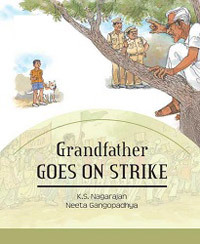 Whilst some of the scenarios, as well as Grandpa’s apparent lack of planning in his protest, may require some suspension of disbelief, young readers are more likely to get caught up in the humour and emotional responses to what is a relevant current issue; and the book raises important questions about whether and how much you would be willing to stand up for what you believe in. A small boy puts stones around a seedling in the middle of a path to protect it. His small gesture causes huge ripples in the future: as time passes, both the boy and the tree grow and the landscape changes too. This is a wonderful book for thinking about the passage of time, as well as hugely interactive: it’s impossible not to join in the repeated warning that gives the book its title; and the illustrations in an appealing blend of monochrome and colour are packed with both central and incidental detail. Read my full review here. 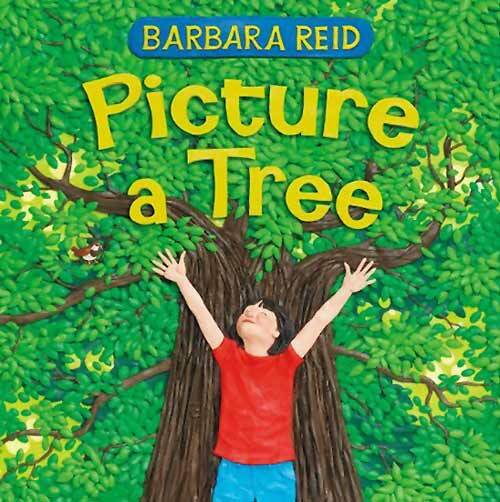 A visual treat, this witty book encourages children to look at the trees around them and see how they mirror their own world around them – whether it’s a tree as a ‘high-rise home sweet home’ or the different styles of their artwork at school. The artwork, all done in plasticine, is stunning. Read my full review here. Growing up in a town with ‘only houses, houses, and more houses’, Thea drinks in the stories her parents tell her of the trees of their childhoods and longs for a tree of her own. One day she gives chase to a leaf caught on a breeze and later, in her dreams, this leaf takes her on a magical journey ‘towards the moon and the stars’, until she meets a beautiful, wise, old tree who recognises Thea’s desire for a tree for its own sake, to climb and play and dream under… When she awakes, Thea has a single seed in her hand. This is a beautiful, gentle story that expresses a child’s deep yearning for something beyond the urban landscape of her experience, emphasised in the illustrations by both the collage-effect bricks of the buildings that close in around Thea and the suggestion that Thea just has to reach out and touch the trees her Mama and Papa describe to her. The blend of realism and imagination gives the story the quality of a fable; and the ending, where Thea plants the seed and nurtures the tree that grows through the years, gently conveys the notion of time, patience and longevity to young children. Children will love the book for its own sake; for adults, it also serves as a reminder of the importance of making room for trees, and indeed all nature, in the ever-increasing freneticism of urban life. When a young tiger wanders into a village, everyone has an idea for how to get rid of it. 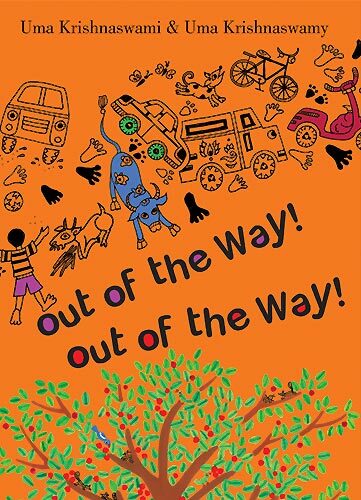 That’s a very bald description of this exuberant book created by two of India’s leaders in the field of children’s books, Anushka Ravishankar and the late Pulak Biswas. 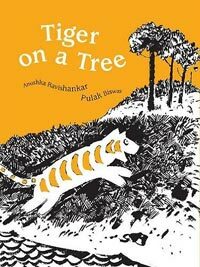 The story follows the tiger every step of the way from arriving on the shore, to swimming across to the adjoining island and climbing up into a tall tree, to its predicament once it is discovered by the local villagers. Narrated in snappy rhyme that elicits an eager response from young readers, the story is brought to life perfectly by the illustrations in black, white and orange. The tiger seems to smile its way through its adventures, and there’s no question as to whose side readers will be on – they will certainly greet the villagers’ final decision as to the tiger’s fate with immense, and no doubt vocal, relief. 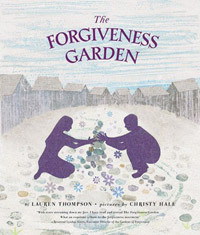 A strong sense of family pervades this story based on a particular fancy-dress parade in Queensland, Australia, in the 1950s, when the author’s mother Faith (referred to as Mum in the narrative) becomes an island princess for the day, drawing on her own heritage and helped by her family and neighbours. 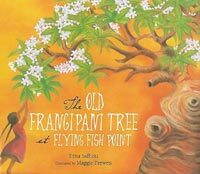 A lot of love and ingenuity goes into making the costume; the beloved old frangipani tree in the garden provides the sweet-scented flowers for a lei and headdress, and works its magic on the judges… The illustrations are gorgeous and you can almost smell the blossom. Read more here. 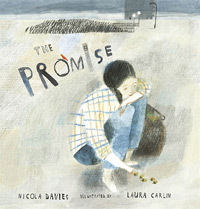 A beautiful fable for our times about a girl living in an urban wilderness who makes a promise when she steals a bag: in it are acorns and when she promises to ‘plant them’, it changes her life and the lives of untold people around the world, thanks to the transformative power of trees… This is a picture book for everyone – and I especially recommend it to secondary school libraries. Read my full review here. A woodcutter sits in a tree to chop firewood and is warned by a passing priest that the branch will break and he will fall down and die if he continues. When the first two parts of the prophesy come true, the woodcutter therefore believes that he must indeed have died – and his fellow villagers are convinced also, despite the woodcutter himself giving them instructions for taking him home, fetching his wife etc. 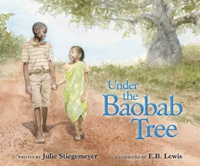 Moyo calls his sister Japera and together they walk along the red dusty road to their village baobab tree. As they travel, Moyo thinks about all the people who gather for different reasons each day under the baobab, the ‘tree of life’ at the heart of their community; and the narrative is punctuated with the refrain ‘ But who will gather today under the baobab tree?’, thus inviting readers to participate in the build up of the children’s journey. Moyo and Japera are the first to arrive but they are soon joined by the whole village for their weekly worship, and the notion of ‘the tree of life’ takes on its Christian connotations without ever explicitly saying so. The story emanates the joy of people coming together to sing God’s praises and the illustrations are themselves a joyous portrait of Moyo and Japera and their landscape. The story was inspired by oral histories that reveal the lengths slaves went to to learn, and the risks they ran; some sources are cited in an afterword. Along with the images of Henry writing on his tree or with a stick on the dry, sandy road, this is a story that will stay with children for a long time, as they compare Henry’s determination and the risks he ran with their own taken-for-granted schooling. 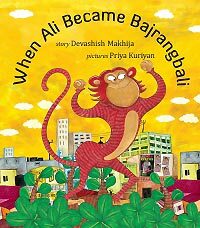 Both the narrative and illustrations buzz with energy, and young readers will chuckle at Ali’s monkey business, as well as his potentially misplaced complacency at the end! The unsettling nature of the beautifully written narrative, in the voice of a young girl retelling the story many years later, is complemented by the illustrations that evoke the realism of early nineteenth-century landscape paintings with their black outlining and watercolour/gouache shading, whilst depicting the extraordinary events of the story – just look at the book cover! 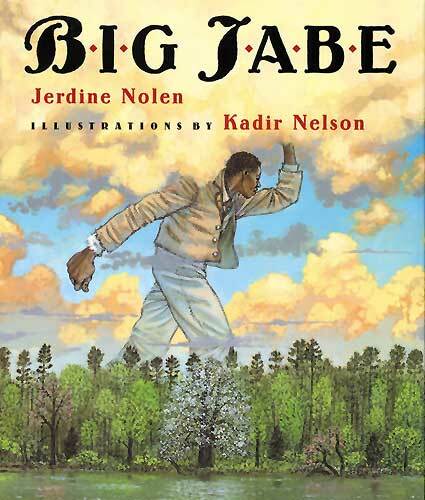 Find out why Jerdine Nolen chose a pear tree for her story in my recent interview with her. 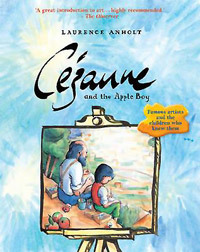 Young readers learn about the work of one of the fathers of modern art, both via the biographical end notes that expand on the main narrative, and from the beautiful illustrations throughout the book that not only bring the south of France in the nineteenth century to life, but incorporate copies of actual paintings by Cézanne. However, what makes this book extra special is that it emphasises the love between a son and his father whom society regarded askance because he was different and did not conform. Irene’s wish is perhaps not unusual – she wants her Papa to spend more time with her – but in Irene’s case, add some apple pips to the mix and her wish comes true in an unusual way… A funny, slightly disturbing and ultimately uplifting story that blends realism and fantasy, with vibrant illustrations to match. 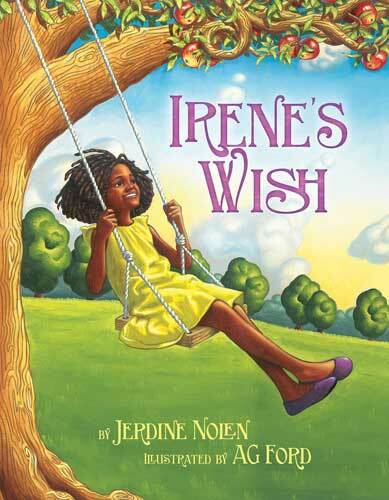 Read more about Irene’s Wish in my recent interview with the book’s author Jerdine Nolen. 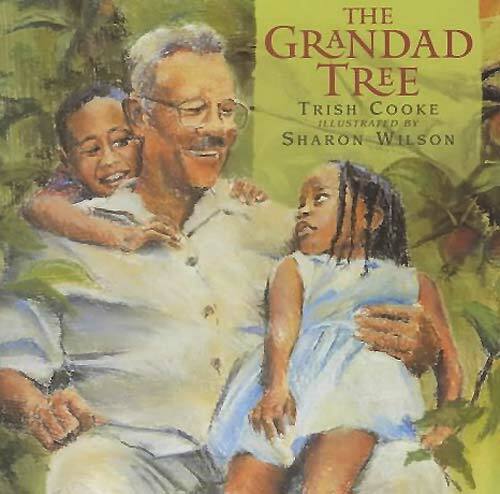 The Grandad Tree is a sensitively created book about the death of a beloved grandparent. For me, the narrative voice sounds like a child next door, peeping over the fence and watching the children playing in the garden with their grandad, but also welcomed as part of the family, so is him/herself absorbing the heart-felt message that, through precious memories, love stays for ever. Read my interview with Trish Cooke to find out more about this beautiful book. The story is the retelling of a traditional Japanese rakugo or ‘joke story’ and this was Allen Say’s first self-authored picture book, back in the days when colour printing was a luxury. 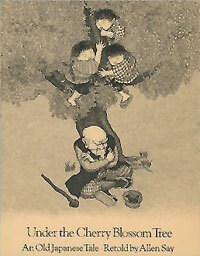 The narrative is a delight, revelling in the absurdity of the tale; and the illustrations demonstrate Allen’s mastery of the ink drawing, with minutely detailed hatching creating light, shade and depth, whilst the facial expressions of the old man and the three mischievous boys who bring about his downfall shine out from the pages. These three books each offer different, energetic retellings of the same African folktale, in which hungry animals have to shout out a certain phrase (the tree’s name or a whole string of nonsensical words) in order to gain the fruit of a magical tree to eat. The selection of animals is slightly different in each version, as is the wise one who helps them – a lion, an aged tortoise and an old woman. In The Magic Bojabi Tree and The Amazing Tree it all comes down to the animal that the other animals consider too small to be of significant use, whereas in The Magic Formula, the animals eventually realise that the only way they will succeed is to work as a team. 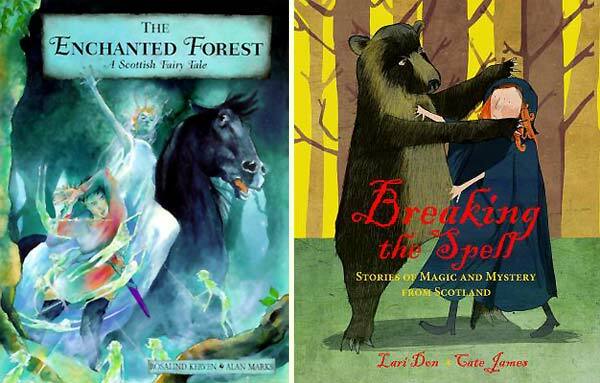 All of these books are excellent and I would recommend exploring the story through all three different versions as a way of adding to young children’s appreciation of the story and broadening their appreciation of the validity of different storytelling voices. 'Branching Across the World: Trees in Multicultural Children's Literature, AG Ford, Alan Marks, Allen Say, Alone in the Forest, Amistad, Andrea Anastasio, Andrea Spalding, Anushka Ravishankar, Bakame Editions (Rwanda), Barbara Reid, Best Friends, Bhajju Shyam, Big Bear Hug, Big Jabe, Breaking the Spell: Stories of Magic and Mystery from Scotland, Bulbuli's Bamboo, Call Me Tree / Llámame árbol, Candlewick Press, Capucine Mazille, Caroline Binch, Cate James, Cézanne and the Apple Boy, Cheryl Foggo, Children's Book Press, children's books about trees, Christy Hale, Connie McLennan, Cornelius Van Wright, Dana Goldberg, Dear Baobab, Derek Blanks, Devashish Makhija, Dianne Hofmeyr, Dingo's Tree, Durga Bai, E. B. Lewis, Epigram Books (Singapore), Feiwel and Friends, Frances Lincoln, Front Street, Gita Wolf, Gladys Milroy, Grandfather Goes on Strike, Grandma Lim's Persimmons, Greystoke, Groundwood Books, HarperCollins, Houghton Mifflin, Ibrahima Ndiaye, In Bon Bibi's Forest, Irene's Wish, Jainal Amambing, Janet Wilson, Janetta Otter-Barry Books, Jerdine Nolen, Jill Milroy, Jin Pyn Lee, John Kilaka, John Shelley, judith Clay, Julie Stiegemeyer, K. S. Nagarajan, Kadir Nelson, Karadi Tales, Kids Can Press, Lari Don, Laura Carlin, Lauren Thompson, Laurence Anholt, Lee & Low (US), Look Back!, Magabala Books, Maggie Prewett, Marcia Vaughan, Marjorie van Heerden, Maya Christina Gonzales, Mita Bordoloi, Neeta Gangopadhya, Nicholas Oldland, Nicola Davies, Nina Sabnani, North-South Books, One Two Tree!, Orca Books, Out of the Way! Out of the Way!, Oyez! 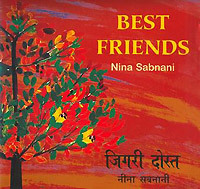 Books (Malaysia), Papillote Press, Paula Wiseman Books, Picture a Tree, Piet Grobler, Pratham Books, Priya Kuriyan, Proiti Roy, Pulak Biswas, Qin Leng, Ram Singh Urveti, Rebecca Page, Rev. Lyndon Harris, Rosalind Kerven, Roseanne Thong, Running Press Book Publishers, Sandhya Rao, Scholastic Canada, Second Story Press, Sharon Wilson, Simon & Schuster, Sirish Rao, Solomon's Tree, Sunita Lad Bhamray, Tara Books, The Amazing Tree, The Boat in the Tree, The Busy Beaver, The Elephant and the Tree, The Enchanted Forest: A Scottish Fairytale, the Forgiveness Garden, The Grandad tree, The Magic Bojabi Tree, The Magic Formula, The Nightlife of Trees, The Old Frangipani Tree at Flying Fish Point, The Promise, The Proud Butterfly and the Strange Tree, The Wishing Tree, The Woodcutter of Gura, Thea's Tree, Tiger on a Tree, Tim Wynne-Jones, Trina Saffioti, Trish Cooke, Tulika Books, Uma Krishnaswami, Uma Krishnaswamy, Under the Baobab Tree, Under the Cherry Blossom Tree, Up the Learning Tree, Veena Seshadri, Victor Reece, Walker Books, Walter Lorraine Books, When Ali Became Bajrangbali, William Miller, Yong-Ha Hu, ZonderKidz, Zora Hurston and the Chinaberry Tree. Bookmark. Have pinned your fabulous list. 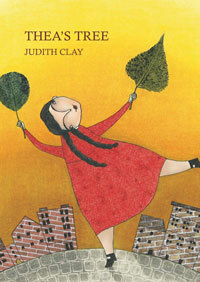 I’ve just published a post about a newly published picture book called Tree by Patricia Hegarty and Britta Teckentrup. I’ve just been and had a look at your review – thank you for adding it to this list; it sounds a beautiful book. 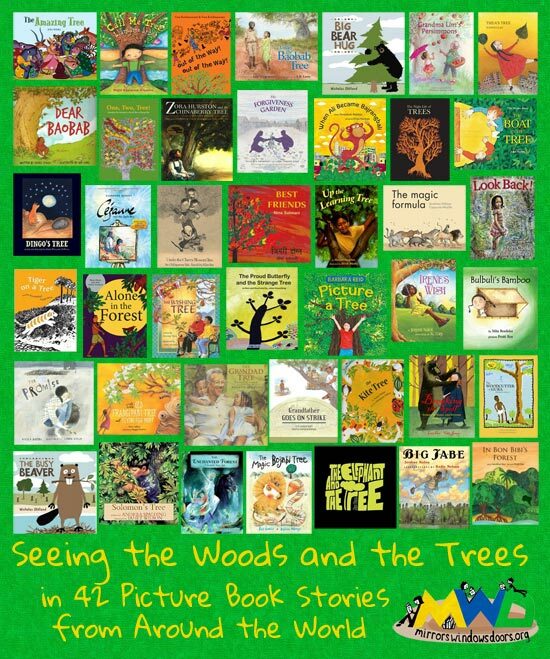 This is a great selection of books about trees and for helping kids learns to appreciate them, this, I think, is especially important as we watch our trees burning up in California. Thanks for sharing your post on Kid Lit Blog Hop. Thank you – and yes, the fires in California are terrible, and so frightening for the people living near them. You missed a lovely one – The Giving Tree by Shel Silverstein! Fantastic list! Will share on Twitter and Pinterest! Thanks for sharing at the Kid Lit Blog Hop! Thanks for featuring two of our books Marjorie!